The psychological damage done by second hand clothing in Africa. They are nicknames for the unwanted, used clothing from the West that so often ends up in Africa. Now, a handful of countries here in East Africa no longer want the foreign hand-me-downs dumped on them because they’re trying to manufacture their own clothes. But they say they’re being punished for it — by the United States. Here in East Africa, Rwanda, Kenya, Uganda, Tanzania, South Sudan and Burundi have been trying to phase out imports of secondhand clothing and shoes over the last year, saying the influx of old items undermines their efforts to build domestic textile industries. The countries want to impose an outright ban by 2019. Across Africa, secondhand merchandise is the primary source of clothing — much as it is for cars, planes, hospital equipment, computers and sometimes even drugs that have passed their expiration date. Buses with Japanese lettering are ubiquitous. Planes in Congo have signs in Italian. Aspirin from Europe past its sell-by-date floods markets in Cameroon. Old medical equipment from the Netherlands lies idle in hospitals in South Africa. Ghana has become a dumping ground for huge amounts of electronic waste. Rwanda, in particular, is seeking to curb the import of secondhand clothes, not only on the grounds of protecting a nascent local industry, but also because it says wearing hand-me-downs compromises the dignity of its people. But when countries in East Africa raised their import tariffs on used garments last year — to such a high level that they constituted a de facto ban — the backlash was significant. The Utexrwa textile and clothing manufacturing factory is one of only two clothing manufacturing companies in Rwanda, and the only one producing clothes for the domestic market. Under the deal, products like oil, coffee and tea are allowed access to American markets with low tariffs. But the White House has the right to terminate the agreement with a country if it feels that the relationship doesn’t benefit the United States. The dispute has thrown into relief the perennial debate among countries, especially developing ones, over how to balance protectionism with the risk of damaging their relationship with an interconnected world. The American response reflects a desire to both protect jobs and have open access to small but promising markets. The East African nations are trying to replicate the success stories in Asia and even the United States, where infant manufacturing industries were initially protected and nurtured before they were able to compete on the global market. Rwanda’s president, Paul Kagame, who has been the most vocal leader about the used-clothing ban among the East African nations, said that the region should go ahead with the ban even if it meant sacrificing some economic growth. East Africa imported $151 million worth of used clothes and shoes in 2015, mostly from Europe and the United States, where consumers regularly buy new clothes and dispose of old ones, often giving them away to charities. At least 70 percent of donated garments end up in Africa, according to Oxfam, a British charity that also sells used, donated clothes to the continent. The Utexrwa factory. 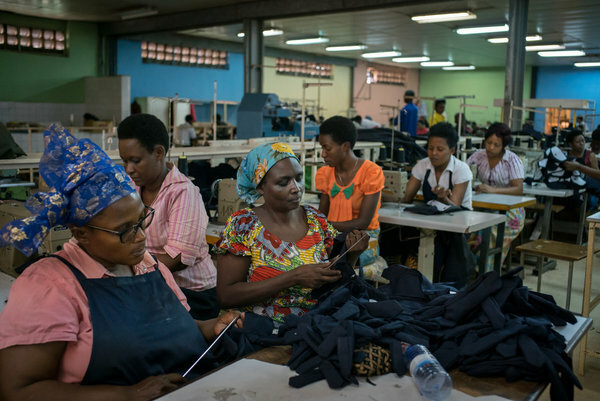 In Rwanda, there is a dearth of skilled workers in tailoring and light manufacturing, and imports of high-quality materials like fabric and yarn are prohibitively expensive. The American threat, officials in the region say, is an example of a Western nation bullying countries that are trying to move beyond what the continent is typically known for: exporting raw materials, not finished products. For countries like Rwanda, a small landlocked state with few natural resources to extract and export, building local manufacturing is vital for development, officials contend. The trade relationship between the United States and East Africa should be founded on mutual respect, he added, “and should not go down the way of 19th century England when it started a war with China over opium,” he said of Britain’s determination to pry open Chinese markets to sell drugs. East Africa could export garments worth up to $3 billion annually within a decade, according to McKinsey, the consultancy. Behind the American response to the East African ban is a group of 40 used clothing exporters, known as the Secondary Materials and Recycled Textiles Association. It says that 40,000 American jobs, like sorting and packing clothes, are at risk. Clothing thrown away by Americans, the association says, will end up in landfills in the United States and damage the environment if not sold abroad. The organization, which describes the East African tariffs as “taking advantage of U.S. generosity,” lobbied for the American response. It did so on the grounds that the East African countries were contravening rules that require them to show they are “making progress” toward eliminating trade barriers to American goods and investment. 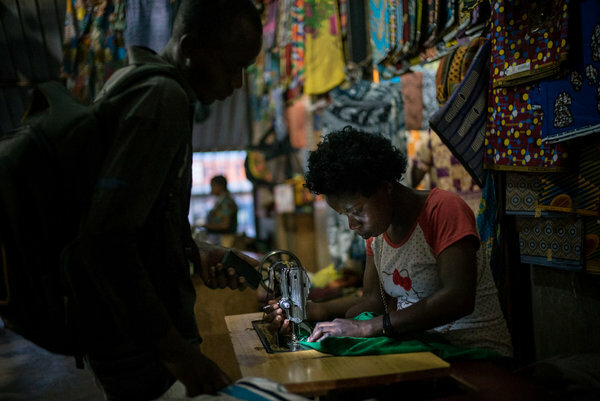 In the dark aisles of the Kimironko market, a woman using an old sewing machine to tailor a pair of shorts, while her client holds out his cell phone to provide a bit of light for her. “It’s hard to argue that the U.S. should continue to give preferential access to its market if the country is taking steps that harms U.S. companies,” said Grant Harris, who served as the principal adviser to former President Barack Obama on issues related to Africa. The United States often uses the trade deal as a negotiating tool. In 2015, South Africa nearly lost its eligibility over a ban on American chicken imports, which it said were killing the country’s poultry industry. Last year, the United States warned the tiny nation of Lesotho that it could lose its eligibility if the government failed to enact political reforms. As South Africa did on chicken imports, Kenya blinked and withdrew its support for the used-clothing ban because it risked losing its lucrative textiles exports to the United States; globally, Kenya exported about $380 million of clothing globally in 2015, much of it made for American companies. The United States Trade Representative now says it will not review Kenya’s eligibility. Despite the possible ejection from the trade deal, which American officials say will be decided at the end of the year, the remaining members appear determined to uphold the ban. Underlying their protectionist move is the damage done in the 1980s and 1990s by economic liberalization. That, and a combination of debt crises, falling cotton prices and cheap Chinese imports, wiped out textile industries across the continent. While African economies were being pushed by institutions like the International Monetary Fund to open up trade, the West protected its textile industries by restricting imports of yarns and fabrics from developing countries. Second-hand clothes at the Kimironko market in Kigali. Kenya, for example, had half a million workers in the garment industry a few decades ago. That number has shrunk to 20,000 today, and production is geared toward exporting clothes often too expensive for the local market. 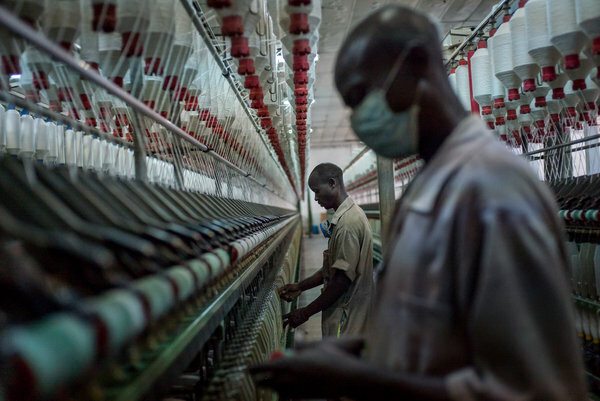 In Ghana, jobs in textiles plunged by 80 percent between 1975 and 2000. Many people in Zambia, which produced clothes locally 30 years ago, can now only afford to buy imported secondhand clothes. Although many support government efforts to build national textile industries, they say that the ban on used clothing should be done incrementally. In Rwanda, where the per capita gross domestic product is $700, many people oppose the ban, saying it has thrown thousands out of jobs distributing and selling secondhand clothes and has hurt the nation’s youth in particular. Since Rwandan import tariffs on used garments have been raised 12 times, clothes sellers in Kigali have watched their revenues plummet. The government decision was premature, they said, put in place before the country was able to produce clothes that are affordable. And though the ban excludes imports of secondhand clothing, it hasn’t stopped the influx of more expensive new clothing from China. And the question remains whether Rwanda, Tanzania and Uganda are ready to build a textile industry of their own. Vital ingredients for that to happen are still missing, and cutting off imports of used clothing alone is unlikely to fix the problem, some in the industry say. Energy and transportation costs in Rwanda are among the highest in Africa, there is a dearth of skilled workers in tailoring and light manufacturing, and imports of high-quality materials like fabric and yarn are prohibitively expensive. There’s also the question of the size and purchasing power of the local consumer market. “Do we have a ready market here to which we can feed ‘Made In Rwanda’ clothes to the population?” asked Johannes Otieno, the manager of Utexrwa, which makes uniforms for the army, the police and hospitals. Mr. Otieno said he opposes the East African ban on secondhand clothing, questioning what Rwanda would do if the United States ejected it from the trade deal. Rags were once used to make paper. What obstacles keep Rwanda from using the clothing in some other way than wearing it? Are there reasons that would prevent processing the used clothing into paper? When Will We All Be Regarded as A Race of People will the right to be treated with respect and dignity. BLACK LIVE MATTER ? Sickening – I have seen it for years first hand when I lived in both Kenya and Malawi. 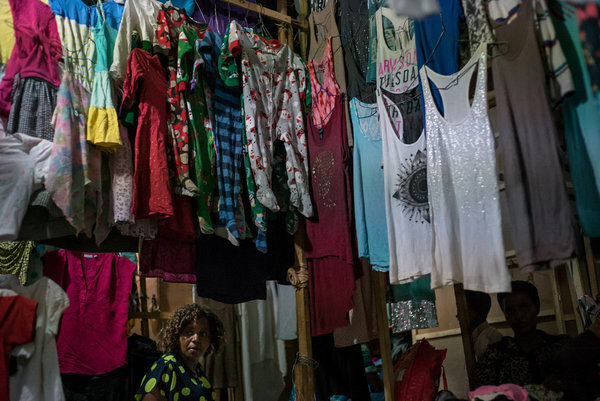 The local people who are willing and able to use home-produced materials to make good clothing are priced out of the market by these hand-me-downs. The developed world, especially the USA and the UK, have set trade agreements that consistently harm developing wold industry to the benefit of our own much larger industries. Then we blame the developing world for not doing better, having riots and civil wars and much corruption! Guess why!! The fault is ours! Meanwhile I’m over here in America buying used clothing myself. Get mad at the people hoarding all the money of the world in their billionaire bank accounts who litrally every time they breed create another wealth hoarder who takes more money out of circulation… not the people who sent free material that can be upcycled. I don’t buy new clothing at all. So am I suppose to feel degraded? Sure it would be nice to be able to afford new, which I can’t, but I like that my clothing has a history and isn’t the same thing everyone else is wearing… I’d still buy vintage and upcycled if I was rich. The Real Africa can do without it period, we can and Will survive without second hand garms, a sharp shock to the system can bring a cure in time ,the mere fact that we debate “if Africa is ready to stand on it’s 2 feet, shows the enormity of the task of rebuilding morale and a driven sense of purpose towards uplifting our textile and tailoring industry in a visible and tangible and creating our market in and out of our borders, . A textile industry that could export to balance trade and be a source of free trade, ethically produced, clothing to compete with the questionable stuff we are importing from China. There is nothing wrong with giving and receiving. It happens all the time everywhere. Do not be offended. I like the post I read here that if you don’t want to wear the garments that are sent, then recycle them into other materials even paper. There are many people throughout the world that only wear recycled or used clothing based on economic, waste or belief. They are not offended, so please do not be offended. Just find a way to accept and reuse. Its a planet thing, not regional or anything else. People donate from their hearts.